I don’t know what all the fuss is about. 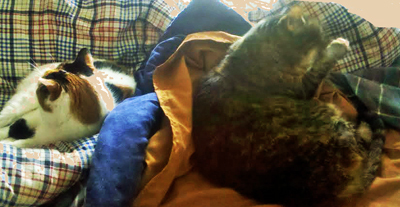 My mom saw these 2 cats together on her bed and raced to get the picture. Creampuff, the ditzy calico on the left, has lived with my mom Cathy for eleven years – since February 2002. Creampuff was in a shelter in Silver City, New Mexico. My mom thought she was too young but the volunteers begged her to adopt Creampuff. This poor kitty had been in the shelter for three months. They gave her some breaks from her small cage but no cat can live in a shelter forever. Creampuff’s number was about to come up. So my mom took her home and changed her name to Creampuff. Creampuff played with Tiger (if you go back far enough in this blog, you’ll meet Tiger). Creampuff wasn’t crazy about Ophelia and my mom was afraid they’d never get along. Creampuff didn’t want to accept Pumpkin either, but Pumpkin is the ultimate diplomat. She waas determined to make friends. So here they are. We think Pumpkin should take over the Middle East crisis. “People are going to think we taught her to do this,” my mom said. But we didn’t. Pumpkin is an adopted cat with a past. 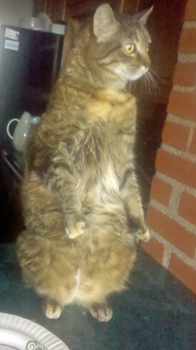 Pumpkin’s foster mom, Karen, tells us that Pumpkin likes to stand on her hind paws and look out at the world. She’s not begging, although she wanted my mom to know her food dish is empty. Pumpkin is not a cat to be swayed by logic. She’s one tough kitty. Fortunately, we get along extremely well. I’m sure you’ll be seeing a few dozen more photos of me, snuggled up next to Pumpkin on our couch and bed. Creampuff, our ditziest housemate, has established her favorite spot on the printer, right next to my mom’s computer. My mom loves the printer, especially because she got it as a review product through the Vine program. Even Creampuff is too tactful to acknowledge that Pumpkin won’t fit on the printer. Pumpkin is as round as her name and, alas, growing rounder under my mon’s benevolent policy towards felines. That new cat Pumpkin is certainly making herself at home. My mom was so excited. “My family is all getting along!” she exclaimed, racing for her camera phone. She woke me up from a peaceful nap. Pumpkin, of course, kept on sleeping. Here’s the truth. Pumpkin likes this spot on the couch. So she’s not just being my new buddy. She’s keeping an eye on the prize – my spot. My mom is doing her part to keep everybody sleeping. She’s started taking me on 30-minute walks twice a day. This Sunday, she says, we’ll make another trip to the farmers’ market and the dog park. My mom has gotten much better at choosing names for her family. She’s come a long way from naming a cat Kitty, as she once did. She didn’t change Keesha’s name becuase it fit – Keesha was a keeshond mix. She tried to change Ophelia’s name when she took Ophelia to the vet for her “new cat” checkup. The vet’s staff was horrified when Mom wanted to call her “Furball.” Later we were all glad; Ophelia was … well, Ophelia. I am named after the Great Dane owned by Dan Dye, cofounder of Three Dog Bakery. That dog made her owner rich, my mom reminds me. So far I’ve just brought her vet bills. But she outdid herself when she named Pumpkin. Just look at these photos. Who said adopting a cat has to be hard? Pumpkin has settled into her new home very comfortably. Doesn’t she look like she owns the place? Where does my mom find these cats? First Ophelia liked to drink out of MY water dish on my crate. Now Pumpkin wants to eat my food right out of my dish! My mom tried to persuade Pumpkin to leave me alone. She picked up Pumpkin, who hates being held, and set her down on the counter, near her own food dish. Next thing my mom heard was a hiss and a bark. She came running over. I won that round. Pumpkin won’t give up. She’s hoping I’ll share. My mom went racing for her camera. So now I have flash bulbs going off and a cat staring intently at my food dish. Who cares? We went on a long walk today and I’m hungry. I’m finally finished with my upset tummy and hope I won’t see a grain of rice for a long, long time. My mom still misses Ophelia but she can’t resist our new housemate. Pumpkin sat on her lap for about an hour today. Pumpkin’s original name was Kerfluffle, or “Fluff.” But she’s not especially fluffy. The shelter called her “Biggums,” which makes sense – she weighs in at a hefty 14 pounds – but it doesn’t fit. Pumpkin is a very delicate, feminine cat. My mom calls her Pumpkin because her fur has orange highlights, she’s shaped like a pumpkin and we’ve got Halloween stuff all over the place. I have to admit, my mom finally chose a winner. Pumpkin is a quiet, sensible, low-maintenance cat. She exchanges respectful sniffs when she sees me. She doesn’t initiate fights with Creampuff. I think she can tell Creampuff is just ditzy – nothing much to worry about there. Right now Creampuff and Pumpkin are having a quiet staring contest. My mom is trying hard to ignore them. So she spent the weekend giving Ophelia fluids and helping Ophelia eat that yucky special food. Ophelia walked around just being Ophelia, Queen of the House. Ophelia started getting really weak on Sunday. It happened SO fast my mom was in shock. On Saturday Ophelia was able to move around freely; she even squeezed into a small bookshelf for a cat nap. She curled up in her kitty condo (see picture). She was awake and alert. But by Sunday evening she couldn’t jump off the bed or the couch. The earliest vet appointment my mom could get was today at 2:30. Ophelia didn’t wait. She was lying peacefully on my bed, which is big and fuzzy, but she kept having more and more trouble just moving. She would try to get out of the bed and she would stumble. My mom put her back on top of a huge stack of towels. Around 1 PM Ophelia decided she’d had enough and she headed up to the Great Sandbox in the Sky, soundlessly, while my mom was working just a few feet away. She looked SO peaceful! It worked out well. She was spared a final visit to the vet and she was ready to go. My mom and I took Ophelia’s body to the vet for cremation. We took a cab because my mom wanted me to come along too and I can’t ride buses. Philadelphia is so primitive compared to Seattle, where I was welcomed on all the Metro buses. My mom realized the cab driver wouldn’t be thrilled if she told him she had a dead cat. So she gently put Ophelia into her big backpack, wrapped securely in an old shirt she wanted to get rid of. My job was to keep Mom’s mind focused where it should be – on me – and distract her from losing a cat she loved. I was successful. We walked home in beautiful weather, even stopping at the dog park so I could play for a few minutes. That’s a two mile walk. I’m totally exhausted. 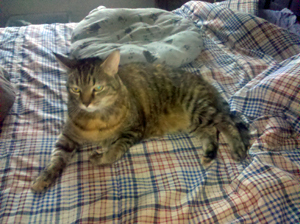 My mom has decided to get a new cat – a tabby, she says, who will be tougher than Ophelia. She doesn’t want Creampuff to get used to being an Only Cat. My mom has been very sad in the last week. She’s way ahead of schedule when it comes to healing from her fractured arm; she now guides my leash with her left hand, which makes life easier for both of us. But Ophelia has taken a turn for the worse. It happened so gradually; she was nibbling, then she would eat only canned food, and then my mom took her to the vet. Since then she’s been on a whirlwind of activity, giving Ophelia fluids and drugs. I’ve always said Ophelia would be trouble. I posted here the day we took Ophelia – all 17 pounds of fur – home from the Seattle Humane Society. But did my mom listen? No. She adored Ophelia from the very beginning. After awhile I got used to Ophelia, too. Recently we’ve been having long chats about life and our trips – a year apart – from Seattle in the cargo section of a Delta Airlines flight. Last week my mom came home to find us sitting together on the couch. She got so excited she ran to take a photo. Pathetic, isn’t it? What’s driving my mom totally nuts is that Ophelia gives out mixed signals. She won’t eat. She let’s my mom do “assisted feeding” with a syringe, but she’s not eating on her own or grooming herself. Ophelia knows where everything is. She walks from one room to the other. 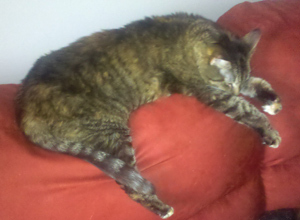 She jumps down from the couch or bed – where my mom places her – and goes off to choose her own place. Right now she’s on my favorite bed, which means I get the floor. Ophelia was headed for the Great Sandbox in the Sky last Thursday. Then she walked over to her scratching post and gave it a few strong swipes. She used the litter box without making a fuss. “She’s not ready to go,” my mom declared. She called our wonderful vet at Companion Animal Hospital and Ophelia got a reprieve. 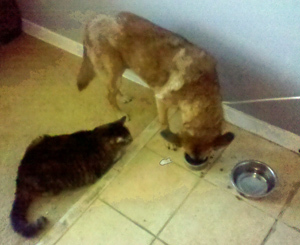 Then today Ophelia walked over to my crate and drank the water from my dish, just like she always did. My mom was thrilled but also frustrated. Wish I could help, mom, but as always, I’m just the dog. I’ll go along either way – comforting Ophelia while she’s here and comforting my mom throughout the process.